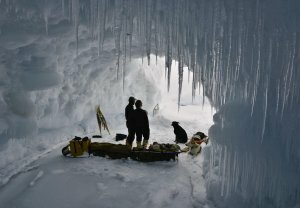 An ice cave on Lake Superior. Photo courtesy Conor Mihell. April is here, and winter is officially over, but we’re still basking in the warm glow of a season full of fond memories and great travel companions! We’d like to thank everyone who made this, our third trip season, such a wonderful and memorable experience! Full trip reports and videos will be released slowly over the weeks and/ or months to come. In the meantime most of the season’s photos have now been uploaded, and can be viewed here. We had our most mature participant to date: at 78 years of age Gerard impressed every group member on our 9-day Eco-Explorers Expedition in the Wolf Lake area! This year we had the honour and pleasure of getting to meet Dave and Deb from The Planet D and travel a section of the historic Missinaibi River! Traveling in our new backyard! Just kilometres from our new home, we summited Mt. Ararat on our “Celebrating Spring” trip. An amazing journey on a seldom-frozen section of the largest lake in the world: Lake Superior! The amazing winter weather we had for (nearly) the entire winter. With the exception of one mid-January thaw, we had wonderful consistent winter weather all season! And most importantly: every single person who joined us for a trip this season – Thank You!